Nicola Marsh's newest release - also her first with Entangled Publishing, is out now! And already gaining rave reviews!!! When investors tarnish the King of Construction’s reputation he’s forced to prove his respectability…by finding a wife! Beck Blackwood, desert bad-boy made good, will do whatever it takes to expand his construction company nationwide. 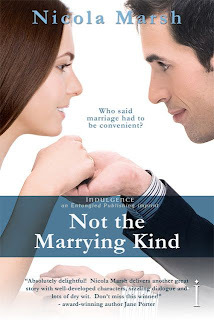 Including blackmail a woman guaranteed to drive him crazy, into marriage. LA party planner Poppy Collins is a woman on a mission: save her sister’s sanity. Determined to keep business afloat, Poppy pitches for the divorce party of the century to Vegas hotshot Beck Blackwood, not expecting a proposal of a different kind. Beck leaves Poppy no option. Marry him or her Divorce Diva Daily secret is out and her sister’s business implodes. He holds a winning hand. However, Beck hasn’t played the game with a defiant woman who has a few tricks of her own! In the city of high stakes and high flyers, can the Divorce Diva and the construction king take a gamble on love and beat the odds?